BERA, Ami, a Representative from California; born in Los Angeles, Los Angeles County, Calif., March 2, 1965; B.S., University of California, Irvine, Calif., 1987; M.D., University of California, Irvine, Calif., 1991; physician; professor; associate dean, University of California-Irvine School of Medicine, Irvine, Calif., 2004-2007; Sacramento County, Calif. chief medical officer, 1999-2004; unsuccessful candidate for election to the One Hundred Twelfth Congress in 2010; elected as a Democrat to the One Hundred Thirteenth and to the three succeeding Congresses (January 3, 2013-present). 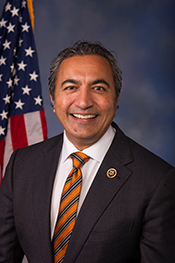 "Ami Bera" in Asian and Pacific Islander Americans in Congress, 1900-2017. Prepared under the direction of the Committee on House Administration by the Office of the Historian and the Office of the Clerk, U.S. House of Representatives. Washington: Government Publishing Office, 2018.